The Overground railway lines in London have been taking shape over the last few years. In 2010 the line from Dalston Junction, running south to termini at New Cross, Crystal Palace and West Croydon became the latest addition. In early 2011 the line was extended north to Islington and Highbury, forming an interchange with other Overground lines. The final part of the plan is to run an additional Overground line from Surrey Quays to Clapham Junction. When that is completed, it will be possible to travel round London in a rather wobbly circle. To form the line, all that is required is to lay about a mile of new track on an old track-bed and the rest of the route will use existing railway lines running west to Clapham Junction. 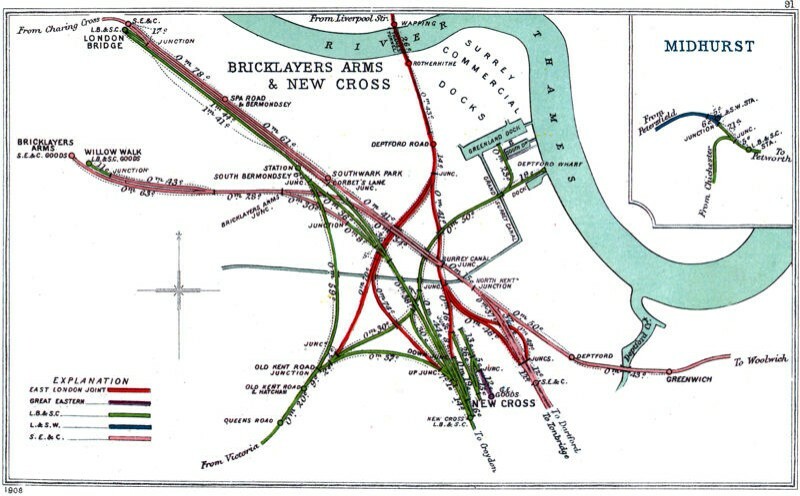 The railway track around the New Cross and New Cross Gate stations is shown (above) on a drawing made in 1908. The vital link is shown (in yellow, enlarged left). The piece of track that needs to be laid follows the line of the red track (highlighted in yellow). (1) Most people probably known that the track under the Thames runs in the Thames Tunnel, designed by Mark Brunel and completed by his son Isambard. (2) The track originally ran north and then looped around to end at Liverpool Street Station, which can be seen labelled at the very top of the enlarged map. (3) Today's Surrey Quays station was previously called 'Surrey Docks'. In even earlier times the station was called 'Deptford Road', as shown on the map. (4) Notice that the old map shows the line of the old 'Grand Surrey Canal' which only ran from Greenland Dock to Camberwell Road. Notice too that, on the enlarged map, it was crossed by no less than seven railway viaducts! When the new track has been laid on the line of the old track-bed, Overground trains will run from Surrey Quays to the existing station at Queen's Road, Peckham, before running west to end at Clapham Junction.